A database of superfamily relationships between Pfam seqeunce families. This database consists of clusters of potentially related homologous protein domain families, with and without three-dimensional structural information, forming superfamilies. 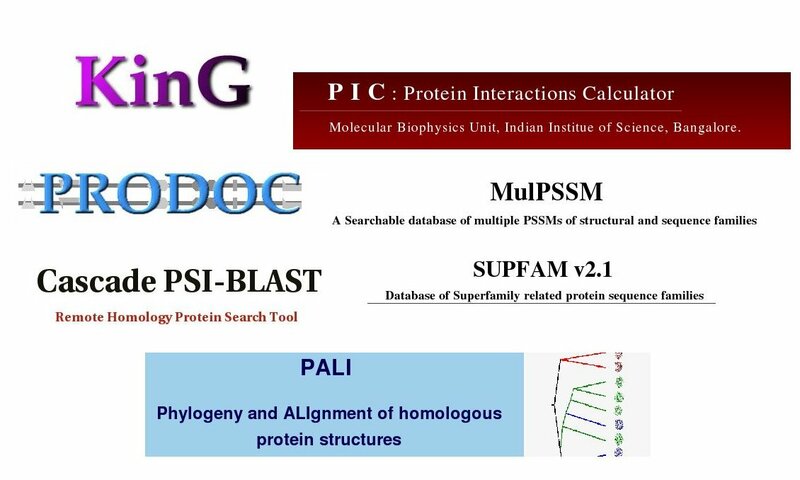 The present release (Release 2.0) of SUPFAM uses homologous families in Pfam (Version 18.0) and PALI (Release 2.5) which are examples of sequence -alignment and structure-alignment databases respectively. Kinases in Genomes is a comprehensive collection of Ser/Thr/Tyr specific protein kinases and similar sequences encoded in the completed genomes of eukaryotes and prokaryotes. This site provides a detailed classification based on sequence similarity of eukaryotic protein kinases (Hanks and Hunter classification). The assignment of functional domains to the gene products containing the kinase catalytic domain is also available. A database of Phylogeny and Alignment of members of SCOP families. This database provides structure based sequence alignments for homologous proteins of known 3-D structure. The alignments available include those of pairwise (two proteins at a time) and multiple (simultaneous superposition of all the structures in a family). The database also provides dendrograms depicting phylogentic relationships based on sequence and structural similarities. A Protein Documentation resource giving the domain architecture of all proteins in genomes with intuitive searches. PRODOC is a repository of domain assignments for proteins encoded in different complete genomes and a tool for querying this information. The database presently comprises of about 698,000 proteins, from 192 organisms of complete genomic data, and all the proteins in the SWISSPROT database. The domain assignments have been taken from the Pfam site. MulPSSM is a database of multiple position specific scoring matrices of protein domain families with constant alignments. MulPSSM consists of PSSMs corresponding to all known structural families of protein domains. For every family we provide multiple PSSMs corresponding to a given alignment which is of high quality. A RPS_BLAST interface enables one to query a sequence in this multiple PSSMs database by selecting structural families. Contributes: V. S. Gowri, O.Krishna Dev, C. S. Swamy and N. Srinivasan. Protein Interactions Calculator (PIC) is a server which, given the coordinate set of 3D structure of a protein or an assembly, computes various interactions such as disulphide bonds, interactions between hydrophobic residues, ionic interactions, hydrogen bonds, aromatic-aromatic interactions, aromatic–sulphur interactions and cation–n interactions within a protein between proteins in a complex. Contributes: K. G. Tina, R. Bhadra, Dinesh D.C and N.Srinivasan. Cascade PSI-BLAST is a search method that detects distant similarities in proteins through the rigorous propagation of PSI-BLAST. In this approach, we perform a 'first generation' PSI-BLAST search for a query in a user-selected database. This could be PFAM, SWISSPROT or SCOP. In earlier assessments, this search method has detected ~35% more relationships at the level of superfamily and improved coverages in protein families by 15%.